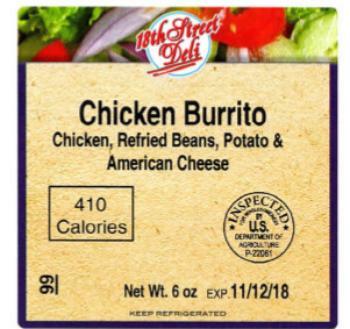 NuVue Foods of Hamtramck, Mich., is recalling approximately 268 pounds of ready-to-eat chicken burrito products. The products contain egg, an allergen not declared on the label. The recalled products, bearing establishment number “P-22061,” inside the USDA mark of inspection, were shipped to retail locations -- specifically vending machines -- in Indiana, Michigan and Ohio. Consumers with questions may contact Mike Weber at (800) 498-3354 or by email at qa@nuvuefoods.com.